Before considering Cosmokrator as an astrological, or interpretive instrument, while still thinking of Cosmokrator in Astronomy mode you can start to use your Cosmokrator as a general monthly calendar. 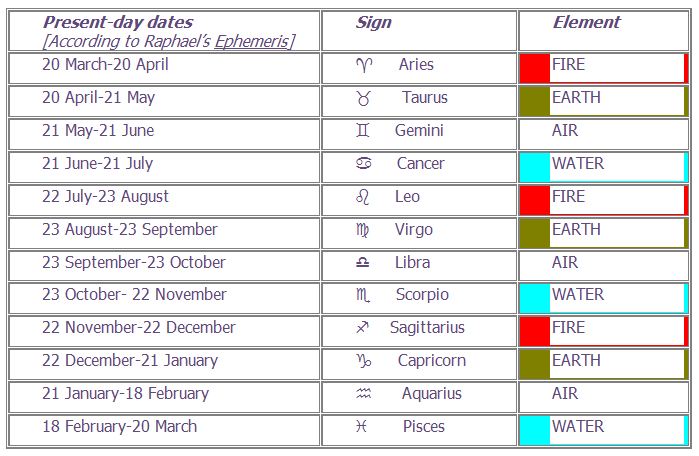 At the change of sign around the 21st/22nd or even 23rd of each month (see table below), position Cosmokrator on your mantelpiece or windowsill so that the current sign is uppermost and catching the light. Month by month you can follow the year through by Sign and get a feel for its qualities, and whether the colour matches the mood of local weather, your state of mind, and every-day events. In the morning, as you get ready for your day’s work, get into the habit of turning Cosmokrator round each day, and looking at each pair of colours as they become the theme for that day. Consider the nature of the Sign in terms of its colour, as well as that of the Ruling Planet and notice any associations that come up in your mind as you start to learn this new language of colour and Time. If your day of rest is not Sunday (Christians), but a Friday (Muslims) or Saturday (Jews), you can redistribute the sequence to suit your cultural perspective. If you think you have no religion, the Cosmos still gives you a Seventh Day different from the other Six, so make it different enough to give you a rest from the treadmill of the working week! 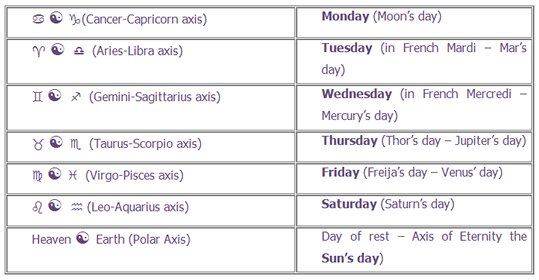 You can also use Cosmokrator's 7 pairs of opposites to go through each day of the week, the 5 World Ages of the past and our present era, and then look at the nature of the upcoming Aquarian Age. Cosmokrator shows the six axes of the astrological World Ages in terms of their colours (the Axis of Eternity is marked by the Black/White Polar contrast). It is of topical interest for us today because we are said to be in the confusing and turbulent transitional phase between the ending of the Age of Pisces and the beginning of the Age of Aquarius. Robert Powell calculates (see table below) that we still have a few hundred years to go before the Sun starts to rise against 0° Aquarius on the first day of Spring, but from all indications that process has already started! Before we can explain the nature of the World Ages, we need again to remember what is meant by the phenomenon of the Precession of the Equinoxes - and its connection with the Vernal Point, as already referred to under Cosmokrator and Astronomy. In more northerly lands such as Mesopotamia, the New Year was celebrated at the Spring Equinox, so the point amongst the stars against which the Sun rose in the morning on that day around 21 March came to be known as the Vernal Point. But every year the point of the Sun’s rising against the constant star background was seen to have occurred very slightly earlier, and it gradually slipped back to rising on the same solar year date against the stars of a new sign (and eventually, over time, through the entire 360º circle of Earth’s horizon). It takes approximately 2100 years for the Vernal Point to slip back through one Sign. The key need to have a Vernal Point is for society to have a starting point to the solar year, and in the main European body of astronomical knowledge this starting point, as secured by seeing the Sun rise against the stars at the Spring Equinox, is conventionally termed the Vernal Point - occurring these days on 21/22 March at 29° every year. In other words sunrise at VP is on the brink of moving out of into . The cycle of slippage backwards of the Sun’s starting point at New Year through the entire Zodiac, taking place imperceptibly over the vastly long era of 12 Signs x 2,100yrs (= 25,200 years, known as the Platonic Year) is termed the ‘Precession of the Equinoxes’. The Precession of the Equinoxes, according to ancient writers, accounts for the different World Ages because of the fact that the Vernal Point moves into the domain of another Sign of the Zodiac which signifies a total change to the quality of the Spirit of the Age. The importance of the Vernal Point is particularly crucial when we need to measure the starting and ending points of World Eras which, according to Robert Powell’s precise stellar calculations, encompass the centuries and millennia of mankind's past. The table below gives - in very broad strokes, in the second to right column - the key stages of mankind's gradual mastery of the vast astronomical clock of the sky. Although these eras are governed by the Sign through which the Vernal Point is moving at the time, it is important to remember to take the operative Sign opposite along with it and consider them as one axis, as the peoples of great past civilizations did - since it is the entire axis that gives the key characteristics of a particular World Age. To take one example, the Leo- (Lion) Aquarian (Human) opposition was symbolized by the Sphinx (other such dual figures are analysed in Book 10). Its quality in terms of colour is a Gold-Mauve contrast. Much of ancient art becomes more meaningful when we realise that composite animal/human figures were invented as a visual language by ancient peoples to describe these World Age axes to sum up the distant memory of past World Eras at a glance. This is forthcoming and will be explored in the Canon of Ancient Near Eastern Art Project on www.layish.co.uk. These are macrocosmic oppositions of Time which Cosmokrator neatly presents as colour contrasts which can convey the forms and spirit of each era. With Cosmokrator before you, the nature of these grand eras of human history is summed up at a glance in just the same way as you will later assess interpersonal dualities – but this is on a macrocosmic, rather than human, scale. Now that we are moving towards an Aquarius-Leonid age (now a Mauve-Gold contrast, with emphasis on the Mauve, rather than the Gold), information about the initial Leo-Aquarian era is fortuitously coming to light at the hands of the archaeologists and geologists as we reach the half-way point in the Platonic Year, as measured from the beginning of the Leo-Aquarian era that had its beginnings when the last Ice Age came to an end - with devastating floods throughout the Northern Hemisphere, ushering in a restart to mankind’s history. The Age of Pisces-Virgo (a Madder Olive Green contrast), where the Vernal Point has travelled backwards through for the last 2000 years, is nearly at an end. Its link with Christian symbolism is obvious (the Fish was an early symbol for Christ, and Virgo speaks for itself as the Virgin Mary – the composite pagan figure is the Mermaid). With the advent of the Age of Aquarius, when the Spring Equinox sunrise will occur for the first time at 0° , the nature of society, its religion and its symbols looks to be on the point of changing radically – the New Age activities of the last few decades point to this (see our books on the structure of atoms, molecules and music under Forthcoming Books).